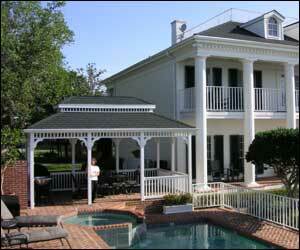 They have the ability to enhance any period style home. Adding one to your deck, patio, or yard is a great way to increase the comfort and beauty of your backyard environment. However, building from scratch can require advanced carpentry skills. 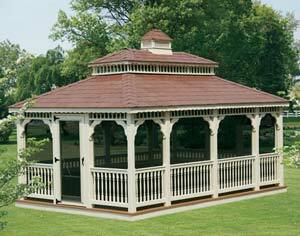 If you don't have the skill or the time you can still get the satisfaction of building your gazebo with a quality kit. Available in a wide variety of styles and designs, there is a kit sure to fit your yard and to create the exact ambiance you desire. Materials range from treated pine, cedar, redwood, to the newer composites and vinyl. Usually available in either pre-cut pieces, pre-assembled components or both, You can spend from a few hours to several days to assemble the kit depending on the size, amount of pre-assembly, and skill level. Windows can be screened or enclosed to house a hot tub. They are also the perfect backdrop or staging for a yard wedding. They are a perfect place for a gas firepit. Add a centerpiece to your backyard. Enjoy a moment of solitude gazing on a nearby garden or host an outdoor party. Add that perfect accent to your lifestyle. The structure can sit on a deck or the ground. Perhaps the floor will be brick and flow seamlessly to a brick path. Tour your backyard. Consider how the home is positioned on the lot. Will modifications have to be made to the landscaping? Go inside and take note of the view through windows and doors that overlook the area where the deck will be. design a deck that can be integrated with the home and yard, while complementing your yard. 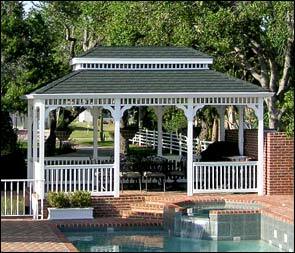 Gazebos can include benches, counters, storage areas, privacy walls, safety gates, gazebos, custom handrails, steps and more.